In 1917, five years after Juliette Gordon Low founded the Girl Scouts of America in Savannah, GA, a troop based in Muskogee, OK baked and sold cookies in the cafeteria of its high school as a service project. Following their success, Girl Scout troops around the country began baking and selling cookies as a way of raising money for troop activities. By the 1920s the practice was widespread and Girl Scout troops began the door-to-door sale of sugar cookies packed in wax paper bags for 25 cents to 35 cents per dozen. 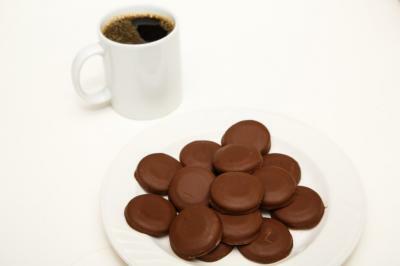 Commercially baked Girl Scout cookies came onto the scene in 1935, when the Girl Scout Federation of Greater New York commissioned boxes of cookies featuring the shape of trefoil on them and "Girl Scout Cookies" on the box. Just a year later the national Girl Scout organization began the process of commercially produced cookies that could be sold throughout the country. These days, you'd be hard pressed to find an office or grocery store entrance where the Girl Scouts haven't pedaled their famous cookies during their annual cookie sale. So it shouldn't be surprising that Girl Scout cookies are among the top things that people binge on each Spring, according to the data from the more than 100mm users of MyFitnessPal. Much like the way MyFitnessPal tracks cookie consumption, the newly released 2015 Small Business Credit Survey tracks the business conditions, credit needs and borrowing activities of small businesses. The survey was jointly conducted by the Fed Atlanta, Boston, Cleveland, Philadelphia, Richmond and St. Louis. It turns out small business owners see community banks as beloved lenders with the popularity of a newly opened box of Girl Scout cookies during the mid-morning slump in an office. The survey found loans to small businesses experienced their first uptick since the credit crisis and community banks were the beneficiaries of this borrowing as the most active lending group. For the most part, small businesses prefer to do business with and take loans from community banks. According to the survey's findings, community banks below $10B in assets extended loans to roughly 76% of small business applicants that applied for them. That compares to only 58% for the biggest banks. That doesn't mean community banks can or should ignore the growing competition of online lenders though. Here, the survey found this group extended loans to roughly 71% of small businesses that applied through such channels, despite significantly higher rates being charged. Fortunately for community banks, satisfaction ratings among small business borrowers are still significantly higher than both larger peers and online lenders. In fact, survey respondents gave community banks an overall satisfaction rating of 75%, while large banks received a rating of 51%, credit unions were 56%, and online lenders were only 15% (among the reasons most commonly cited for dissatisfaction here were high interest rates and unfavorable repayment terms). Of course, community banks never rest, as there is always room for improvement. So to help your teams improve here, consider that some of the reasons small businesses said they were dissatisfied with lenders across the board were: a lack of transparency, lengthy wait times for credit decisions, and difficult application processes to name a few. Further, since 50% of small???? businesses said the loans they received did not meet their overall lending needs, community banks would be well served to listen even more closely to what the client is trying to achieve before pitching a structure or going down some road that doesn't fit only to find out at the end. There is always work to be done to improve, but it is great to see community banks are loved by small business owners. Perhaps the Girl Scouts can provide a lesson here as well for customer facing relationship teams chasing the business - if you provide people with the products and services that they want, they are sure to eat it up. Yields were up 3bp as investors moved money from safety toward riskier assets. Bank regulators have released a new proposal around compensation for employees in the banking industry that will go into place later this year. For banks <$1B: the rules exempt these banks and also do not require disclosure of compensation that is not incentive-based. Banks $1B to $50B (Level 3): allows regulators to require bank to follow restrictions for Level 1 or 2 institutions depending on the complexity of operations or compensation practices. Level 1 and 2 banks: requires highest paid employees to wait at least 4Ys to get part of annual pay; subjects pay to 7Y clawback if found to have engaged in misconduct or taken actions that lead to large losses; hold back at least 60% of incentive based pay for 4Ys; expands requirements beyond top executives to material risk takers; identifies material risk takers to any individual that could commit or expose at least 0.5% of an institution's assets or who is specifically designated by regulators as such; and only applies to incentive based compensation. Given this transfer or risk from the entity more to the individual, look for impacted staff to demand much higher salaries, for a likely uptick in M&A, more executive turnover and for banks to significantly increase equity amounts to this group based on future hurdles to retain them. 1) Glacier Bank ($9.1B, MT) will acquire Treasure State Bank ($71mm, MT) for about $12.9mm in cash and stock, or roughly 1.3x tangible book.